Lt Gen MM Naravane, AVSM, SM, VSM, General Officer Commanding-in-Chief of Eastern Command is on a three day visit to Trishakti Corps. On arrival at Sukna on 28 Jan 19, the Army Commander was received by Lt Gen CP Mohanty, GOC, Trishakti Corps and was briefed on the operational situation and preparedness. On 29 Jan 19, the Army Commander accompanied by GOC Trishakti Corps and GOC, Black Cat Division met Pawan Chamling, the Chief Minister of Sikkim and discussed various activities being undertaken by the Army. 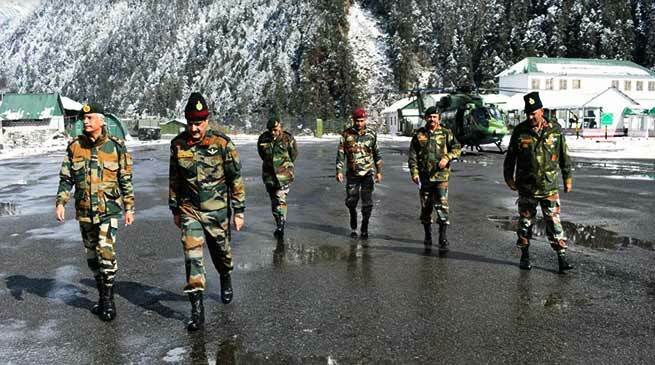 The Army Commander accompanied by the GOC, Trishakti Corps visited forward areas, where he was briefed on security situation along the border and also interacted with the troops. The Army Commander complimented the soldiers for their professionalism, dedication and commitment for maintaining round the clock vigil in inhospitable terrain and adverse climatic conditions.